If you are reading this chances are you are where I was in December of 2014. I knew something need to change and I knew I was going to need some help doing it. Somehow I found my way to this page and in the process changed my life. My goal was weight loss. I was a 5'9 54 year old male pushing upwards of 210 lbs. If you look on your Doctor's wall during your next physical and put those numbers into the weight chart you will see my situation summarized in a word-- obese! Not good.... I needed to do something. While my weight situation was bad news getting worse it was also a blessing in disguise. It was through this series of events that brought me to Cr8zfit. Or more specifically-- Rebecca. What I can tell you is this--Rebecca is NOT what you might expect. I have come to know Rebecca as this smiling, petite, bouncing with energy, ripped, "Cali Girl". There is so much "positive" energy in this place it is amazing. The initial consultation begins...we do the tour... we chat about the past...at some point I share with Rebecca my goals with emphasis on "the number". I don't want to feel better "on the inside". What I want to do is hit 175 by the end of March (Spring Break). Can you do it? At this point I am getting a bit nervous. I did not expect this. My prospective Trainer just committed to getting me to my goal-- In my time frame! 175 was going to happen... I'm in. 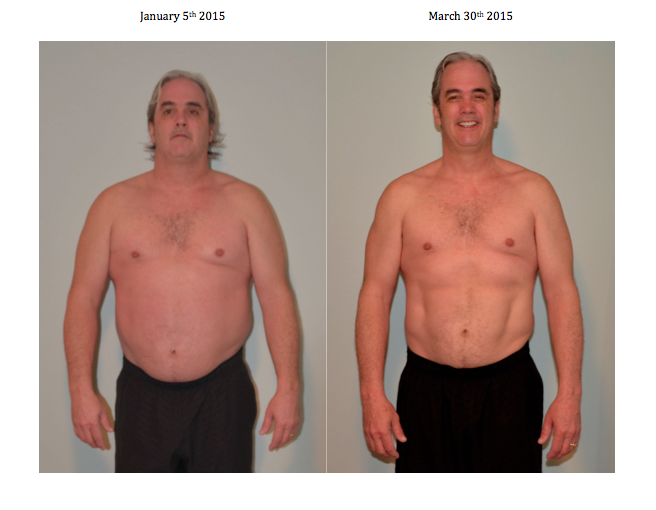 To make a long yet awesome story short--I lost 35 lbs in three months working with Rebecca! If you are serious about making a change and are willing to follow your Trainers guidance you will find no better trainer, motivator, nutritionist, friend, than Rebecca Clem. Good Luck! Sharing a passion for wellness, I met Rebecca over 5 years ago, and was immediately drawn to her positive energy and amazing personality. I quickly got to know her and truly respected her depth of knowledge, as well as her passion for all areas of health and fitness. After moving north, I sustained a shoulder injury and, in order to avoid surgery, I went through a year of rehabilitation before I finally regained a full range of motion. As a very active person, this had a tremendous impact on my lifestyle, and left me feeling mentally and physically defeated. I had lost much of my overall strength, and had created many muscular imbalances while compensating from my injury. When I realized I had reached my lowest point, not wanting to exercise at all as it emphasized all the things I could no longer do, often bringing out new aches and pains, I knew I needed someone to guide me and help to not only restore my strength, but also my spirit. Rebecca immediately came to my mind. Although we had lost touch over the years, I nervously sent her an email explaining my story, as admitting my current state felt difficult and embarrassing. She quickly responded, easing my nerves as if we had never lost touch, and was more then willing to do whatever she could to help. Because I knew she was the best for the job, I drove 45 minutes to see her a few times a week. Designing specific, creative workouts to help strengthen my entire body, being cautious not to irritate my shoulder, Rebecca inspired me to find my way again. Always paying close attention to my imbalances, never allowing my body to cheat, all while pushing me to my limits, every workout encouraged me to continue to move forward. I felt amazing every time I left Rebecca’s studio, not only physically, but also mentally. Rebecca did more then get help get my body back into shape, she renewed my confidence and strengthened my spirit. I highly recommend Rebecca to anyone who’s lost their way, as well as those who need inspiration to begin. No matter what level you're at, Rebecca’s dynamic style, extensive knowledge, and innovative approach creates a comfortable yet inspirational environment for physical and mental growth. Rebecca is, hands-down, an outstanding leader in the fitness industry. "As a physician, I was looking for a specific type of personality and training regimen in a personal trainer. I came across Rebecca, and after only our first meeting, I was absolutely sure she was what I needed to accomplish my fitness goals! That has proven to be true over the past year that we've worked together. Rebecca meets regularly with me to discuss my weight loss and strength training goals and creates personalized workout routines, coupled with nutrition plans, to achieve those goals. She is full of energy, alway upbeat and motivating, and has partnered with me to help me become much more healthy and fit! I would recommend Rebecca to absolutely anyone who is looking for a knowledgeable, dedicated, and motivating trainer who is looking to improve his/her overall health and wellness. She is amazing!" "I owe Rebecca Clem a real debt of gratitude. When I had knee surgery a few months ago my surgeon told me that in twenty years he had never seen such a severe meniscus tear. My recovery would be likely slow and painful. Rebecca came to my rescue. Even though I live at a distance, she gave me specific exercises to help bring the knee back to full strength, with clear instructions and helpful diagrams. I developed a routine thanks to her exercises. I really appreciated her speedy skillful advice. Thank you Rebecca." I had a chance encounter with Rebecca at a gas station when I was pregnant with my second child. Upon request, she gave me her business card. After delivering my son, I had little success at losing the ‘baby weight’ on my own. After more than six months of futile attempts at getting back into shape, I gave Rebecca a call. She was as pleasant and approachable as I remembered from the day I met her. Her training style is firm but encouraging and exercises are tailored to meet your personal needs. Rebecca has given me a new outlook on how to exercise in terms of routine and method. Without any hesitation, I recommend Rebecca Clem to anyone looking for personal training sessions that are private, personal, and fun.